Books illustrating kata and technique through still images are inadequate as a vehicles to convey proper technique, movement or the dynamics of generating power that are unique in many styles of karate or other martial arts. 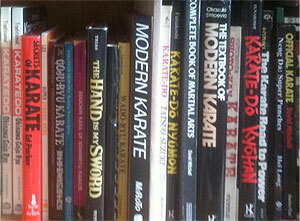 I love karate and other martial arts books. They can be great resources for history and the lives of those who practiced their arts. In this way they can be a link to our own past, our own tradition. But books can only present technique in still pictures or images, and this is the problem. In karate and kung fu books, for example, kata (choreographed series of techniques performed to a precise pattern) are portrayed in a series of images showing one position followed by another, such as a step and punch, a block or double handed technique followed by another movement or technique. The most obvious problem with this format is that still photos, even with commentary, can't transmit kata's speed of execution, tempo and rhythm of movement. Still photos in these books, which are often small, also just don't show the basics of movement very well. This problem was directly presented to me many years ago. In Japan I had studied with Mas Oyama (kyokushinkai) for some time. His organization was still small with only two dojos in Japan (1961) but with a growing number of schools scattered across the US. Upon my return to the States Oyama asked that I represent him and visit the US dojos and report back to him on their status and proficiency. I did and I was glad to report back that many dojos and teachers (largely adopted from other styles) were doing an adequate job, save one. In this dojo my eyes were treated to a strange version of Kyokushinkai karate. Basics weren't great, but the kata was terrible exhibiting wild technique and poor execution -- to the point that some of the kata were virtually unrecognizable. Over dinner with the sensei I curiously asked about his kata and how he learned it. "Well," I was told, "I learned them from Oyama's book, and others." Another problem with kata learned from books is that much of the movement within a technique is not shown, the images usually limited to the starting and ending position of techniques. Missing are the angles, in-between movements (sometimes subtle), hand positions and changes, etc. It's like trying to teach tennis by still photos that only show the beginning of a wind-up and then the end position of follow through. The reader would not learn much about hitting the ball this way. In kata the in-between positions and movements are often called the key to understanding possible applications or meaning of various techniques within kata. On a deeper level is something not understood by the majority of karate-ka, even many historians: not all styles of karate move, step and generate power the same way. Nor do modern Japanese "do" arts (Judo, Kendo, etc) versus many classic Japanese (Samurai) arts (jutsu). Likewise body dynamics vary greatly between various Chinese arts. This is one of the most misunderstood aspects of martial arts today - how different styles of karate and martial arts move, step and generate power. This aspect I will delve into in a little detail here since it is so little understood. When I talk about moving, stepping and generating power, I am not only talking about body and hip rotation here (exterior muscle power used to generate power and speed within body segments rotating around a single axis), which are the body dynamics common to most Japanese karate systems (with possible exception of some forms of Naha-te). For this reason most students trained in Japanese karate think that all systems move pretty much the same way. They don't. Some old Okinawan karate and many Chinese systems use very different methods of body dynamics - how the hips or koshi are used, or not used, pelvis position and movement, rising and falling energy, compression in the shoulders and trunk, use of torque, body arches and alignment and coordinated movement of various body segments. For example, the methods of moving, stepping and generating power of Naha-te expressed through Goju ryu karate's founder, Chojun Miyagi, have changed first with Miyagi (after his teacher Kanryo Higaonna's death in 1915), and changed again as expressed by his major exponents (although the inherited original movement is seen in purer form in the execution of Sanchin kata which uses virtually no hip rotation). In short, Japanese Shorin ryu karate, Shotokan, Shito-ryu, and others move and generate power differently from some older Okinawan Shorin-ryu styles (which teach the old way) although many teachers and systems in Okinawa have adopted the simpler to learn Japanese way of movement. Many of these older Okinawan karate body dynamics were utilized in various degrees by founding (Okinawan) masters who brought karate to mainland Japan. They were taught to some degree, but rarely vocalized. But the constraints of class teaching and non-verbalization limited understanding. As a result most Japanese karate students today instead have learned rotational generation of power, although interestingly many Japanese students now make pilgrimages to Okinawa to learn and practice the older ways. Different expressions of body dynamics are especially prevalent in the Chinese arts. White Eyebrow for example uses very different body dynamics from Praying Mantis or White Crane (which had influence on Shorin-ryu, Goju-ryu and Matsumura Seito karate descended from Hohan Soken). In similar fashion Samurai martial arts differ in body dynamics from their modern counterparts. Practitioners of the older weapon arts such as kenjutsu (sword art), early forms of jujutsu (empty hand body manipulations taught as an adjunct to weapon arts) and diato-ryu (a reported ancient form of Samurai jujutsu -like self-defense against weapon and other attacks) all moved very differently (restraints of heavy armor limited natural movement) from their modern counterparts (although when practiced today many students are not taught the old ways of moving) who practice kendo or aikido (which drew much of its technical inspiration from daito-ryu) today. Many who practice these old arts correctly must re-train their bodies to walk, move, turn and develop power in what seems to be a very unnatural way, something that often takes years to accomplish. Again, these elements of moving, stepping and body dynamics can't be shown by still photos. Thus the problem for books and photos within them is transmission. Books are inadequate to accomplish this goal. Transmission was one reason karate students often practiced one kata for years -- to learn the body dynamics central to an art. Gichen Funakoshi (the Okinawan karate master, founder of Shotokan karate and often considered the father of Japanese karate) studied Naihanchi kata (Teeki) for years under Anko Azato (a friend of his family who had been as student of the legendary Shorin-ryu karate master Bush Matsumura). Applications can potentially account for part of this length of study (although it is unclear the extent applications were taught to Funakoshi at this time), but more central is the proper mechanics of stepping, alignment, movement and body dynamics of power -- learning to generate whip-like power in the kata when positioned in a small horse stance which restrict hip movement and body turning capability. Choki Motobu (the Okinawan karate master who also was an early founder of Japanese karate) considered this kata the "mother of all kata," thinking it contained all the essential elements needed for his karate. This is why Naihanchi for many Shorin-ryu styles serves and a functional equivalent of the role played by Sanchin in Naha-te styles like Goju-ryu and Uechi-ryu -- teaching body dynamics and the expression of power. Thus both Okinawan karate masters who contributed to the development of Japanese karate, Kenwa Mabuni (founder of shito-ryu) and Chojun Miyagi (founder of Goju-ryu), studied Sanchin in similar fashion under their Naha-te teacher Higaonna. Despite these limitations students within various martial arts organizations often buy a book by a master and then try to mimic the movements of technique by using the still pictures as reference to tailor their own performance. But without proper transmission they are merely learning a robotic karate, the outer shell the inner technique. A good friend is a high ranking exponent of an Okinawan Shorin Ryu system of karate which has greatly expanded over the last 30 years. Its founder produced a well known book which proved to be a two edged sword. On one hand it served as text book for those in the style's ever expanded network of dojos. On the other hand too many students were just copying the still photos in the book of kata and missing the inner body dynamics as well as intermediate moves. High ranking exponents would show up at the system's headquarters performing robotic kata stylized to sequences shown in the book. This problem began with the publication of the very first karate books in Japan during the 1920s and 1930s by Okinawans who founded Karate on the Japanese mainland such as Gichen Funakoshi, Kenwa Mabuni and Choki Motobu. The books outlined karate's philosophical and ethical principles as well as the authors on views on its history (tailored in such a way to enhance karate's acceptance on mainland Japan). As to kata Gichen Funakoshi depicted in still images 15 kata that would serve as core to his teaching curriculum in his 1922 and later 1925 books. Kenwa Mabuni included just one or two kata in each of his 1934 and 1935 books (although he did include detailed description of applications). Choki Motobu's early books focused on fighting drills and on one kata Naihanchi (Teeki). In Mabuni's 1934 book called Goju-ryu kata "Kobuo Jizai Goshin Jutsu Karate Kenpo", for example, Mabuni outlines two kata: Sanchin and Gojushiho. While Sanchin was documented in a series of still images (line drawings which in themselves are imprecise), there was little documentation as to how it was to be performed - surprising since Sanchin was considered a kata to teach fundamentals. To the uninitiated this presentation would be of little use and undecipherable. At best it served as a simple visual reference to the sequence of technique, not to how the technique itself was to be performed. Books on karate at this time were new methods of documentation. They quickly and effectively introduced and promulgated basic information of this new art karate being introduced in mainland Japan from Okinawa. Previously on Okinawa students learned directly from a teacher. The idea of a class in karate was thus also new, something started in the Okinawan school system in the early years of the 20th century (before karate's introduction into Japan) by Anko Itosu (a teacher of Funakoshi, Mabuni as well as Motobu). Class teaching was a new format, something that substituted group practice for private one-on-one instruction. The reason why a single kata was practiced for years under a private instructor was to impart the elements of complicated body mechanics, movement and stepping something that would take years to master. It was mastered by feel, students learning how technique felt when done correctly. Class teaching greatly complicated this transmission (not all students gaining equal proficiency in methods that required some talent to obtain). It was natural, probably essential for body mechanics to be simplified to teach in a class setting. In class students could not be given individual attention and minimal verbal instruction. Those who studied karate in the Okinawan schools system were kids who studied karate as physical education in a class structure (group practice) for a few years at best. Most were not committed to a lengthy process of learning and few had access to private teaching. It was also very difficult for students to see and understand how their teachers might have moved and developed power (there is some argument as to the actual body mechanics of Itosu and his associates who led classes). In practice teacher's movement and body dynamics is often minimized through long practice to the point they are very difficult to recognize by those who are not insiders. My aikido teacher, Roy Suenaka, was also a long time student of Hohan Soken (who taught White Crane within a shell of traditional Okinawan Shorin-ryu Karate), the great Okinawan karate master who inherited his technique through the uncle of Bushi Matsumura who many consider one of the founders of Okinawan Shorin ryu karate. Suenaka's hand techniques are lightening fast, but it took many years of karate study and familiarity with some old Shorin ryu karate styles as well as a little White Crane to recognize the distinctive hip/koshi twinge (fast whip) behind Suenaka's technique-- something traced to Soken's White Crane (and perhaps Tomari-te) that influenced much of old Shorin-ryu body dynamics. This example was to me a good illustration of what Richard Kim used to say, "the secret to karate is being able to see what you see." Even in my own Seido karate, when its founder Tadashi Nakamura (Kaicho) demonstrates traditional Japanese karate (he was a senior student of Mas Oyama who was also one of my first karate teachers), much of what he does in terms of Japanese and other body dynamics is not evident - things only gained by long term careful observation and impossible to pick up from any series of still photos in his books. Even though many of his students have long term practice directly under him only a few can adequately mimic his powerful movements. Thus in summary, kata and technique portrayed in books should be viewed at best as a robotic presentation and used only for reference to see the beginning and end moves of technique, no more. Video is better if shown in detail, especially if technique is in slow motion, but even here the internal dynamics of generating power, speed and control are difficult to see (minimized through practice) or purposely not shown in front of a camera). Good transmission of technique, body movement and dynamics of power is a difficult process. If you are a serious student of a martial art, study under someone who can actually teach you the inner art within the outer technique. Observe carefully and remember books alone will not suffice. Christopher Caile is the founder and Editor of FightingArts.com.